What shameful secrets was her husband hiding? Is Grace in danger? And can she survive the truth? However terrible it may be. As soon as I started to read His other life I was intrigued. 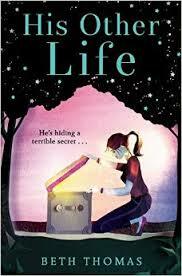 Beth’s writing was just amazing (she is a very good storyteller) this drew me straight into the story. I was slightly confused on the genre it was a bit mixed one moment I thought I was reading chicklit with my feet up with a cuppa and the next I was on the edge of my seat like a thriller read would which as I said confused me a bit. But don’t let this put you off this was a very minor thing and actually probably just me. I loved the mention of Didcot which is a town not so far from me and I have friends there. I am ashamed to admit this is the first book I have read my Beth Thomas I have no idea why but I will defiantly be on the look out for more from this author.